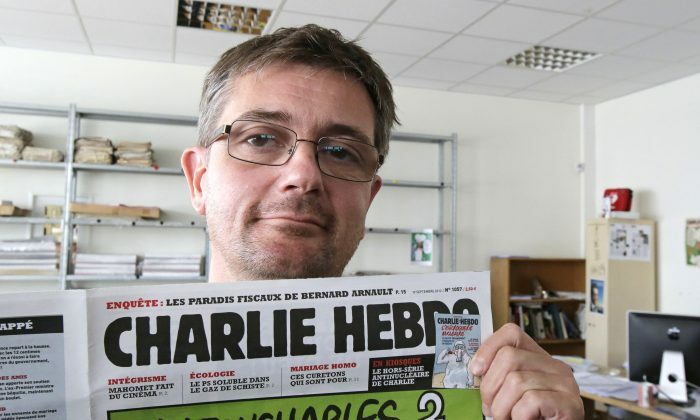 Stephane Charbonnier, the editor of satirical weekly Charlie Hebdo, is among those who were killed in a terrorist attack on Wednesday, according to French media reports. Two or three gunman stormed into the offices of the weekly in Paris, shooting staffers and killing 12 people. They shouted Allah Akbar, which in Arabic means God is great. The attack just moments after the magazine’s Twitter account posted a cartoon wishing a happy new year to the leader of terrorist group ISIS. It also came after the magazine featured a new book in a recent issue that depicts the French government in 2022 being run by Muslims. The gunmen asked for the victims by name, according to reports. Georges Wolinksi, Bernard Verlhac–known as Tignous–and Jean Cabut–known as Cabu–have been widely reported as three others killed in the attack. Radio France chief executive Mathieu Gilet said via Twitter that Bernard Maris, a contributor to the magazine, was another of the victims. The magazine has been attacked before for its portrayal of Islam and the Prophet Mohammad, including having its offices being firebombed in November 2011 for publishing a cartoon of the prophet. Following another incident in 2012, Charbonnier defended his publication. “I have been in this newspaper for 20 years, it has been 20 years that we have been caught and caught of being provocative, it just so happens that every time we deal with radical Islam we have a problem and we get indignant violent reactions,” he told Al Jazeera. Charbonnier and the magazine received criticism from many, including foreign minister Laurent Fabius. “Is it really sensible or intelligent to pour fuel on the fire?” Fabius wondered when the magazine published cartoons of the prophet in 2012, despite the government urging them not to. The magazine was even banned in 1970 for publishing a spoof of reverent French coverage of the death of Charles de Gaulle, the former president. To sidestep the ban, the magazine was renamed from Hara-Kiri Hebdo to Charlie Hebdo. The magazine faced some financial trouble, folding in 1981, but relaunched in 1992. It currently has a circulation of around 45,000. Charbonnier was the editor since 2012, but had been working there since the relaunch. He grew up drawing cartoons. Early reports indicate at least four cartoonists, among others, were killed in the attack. Another at least 10 people were wounded. France24 named Charbonnier, Jean Cabut, Tignous, and Wolinski as some of the victims. An anonymous member of the Charlie Hebdo staff indicated to French media that the magazine had received numerous threats recently, but didn’t take them seriously. “The last few months, we didn’t feel an immense worry despite the threats. Of course our offices were under police protection, which reminded us of the threats. “harb [the magazine’s editor] was under police protection but sometimes he would move without policemen, which was a sign that he wasn’t worried at every moment,” the staffer said.